The BBC Symphony Orchestra's 2016/17 season at the Barbican, under chief conductor Sakari Oramo, includes a fine crop of world and UK premieres from Brett Dean, Neil Brand, Kaija Saariaho, Peter Eotvos, Michael Zev Gordon, Nicola Lefanu, Philip Cashian, Wolfgang Rihm and Detlev Glannert. John Adams Doctor Atomic gets an outing and a Total Immersion event celebrates Philip Glass's 80th birthday. Rarities from a past age include Florent Schmitt's music for Anthony and Cleopatra, and Berlioz's Grande messe des morts gets a welcome outing as does Sir Arthur Bliss's The Beatitudes. Sakari Oramo opens the season with music by Richard Strauss and Brett Dean, including the UK premiere of Dean's suite Knocking at the Hellgate from his opera Bliss. Brett Dean pops up again in a concert conducted by Joshua Weilerstein, when Allison Bell and Allan Clayton join the orchestra to perform Dean's From Melodious Lay (A Hamlet Diffraction for Soprano, Tenor and Orchestra), a work which will give us some pre-echoes of Dean's Hamlet opera being premiered at Glyndebourne in 2017. 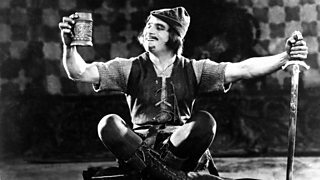 Timothy Brock conducts the BBC SO in Neil Brand's new score for the silent film Robin Hood (starring Douglas Fairbanks) which is premiered as live accompaniment to a screening of the film. And Neil Brand's A Christmas Carol will also receive an outing, conducted by Marin Andre. Kaija Saariaho's True Fire receives its UK premiere conducted by Santtu-Matias Rouvall with baritone Gerald Finley. Edward Gardner conducts the UK premiere of Peter Eotvos's The Gliding of the Eagle of the Skies in a concert which includes Janacek's Taras Bulba. Eotvos' opera Senza sangue receives its UK premiere with Simone Young conducting, plus mezzo-soprano Christine Rice and baritone Russell Braun. Philip Cashian's Piano Concerto 'The Book of Ingenious Devices' is premiered by Huw Watkins, with Oliver Knussen conducting a programme which also includes music by Richard Strauss and Elgar. Sakari Oramo conducts the premiere of Michael Zev Gordon's Violin Concerto (with Carolin Widmann), plus music by Kabalevsky and Shostakovich. Nicola Lefanu's The Crimson Bird (a new commission from the RPS) is premiered in a concert conducted by Ilan Volkov with music by Shreker and Rachmaninov. Wolfgang Rihm's Piano Concerto No. 2 receives its UK premiere with pianist Nicolas Hodges and conductor Lothar Koenigs. Another UK premiere is Detlev Glanert's Megaris conducted by Sakari Oramo, with music by Nielsen and Sibelius. Music for the stage in its various forms is a thread running through the season. The French composer Florent Schmitt gets star billing as Sakari Oramo conducts Schmitt's incidental music to Andre Gide's translation of Shakespeare's Anthony and Cleopatra, which will be performed with excerpts from Shakespeare's play performed by actors from the Globe Theatre, directed by Iqbal Khan. Semyon Bychkov's Beloved Friend project explores the music of Tchaikovsky, combining performances of Francesca da Rimini, Manfred, Piano Concerto No. 2 (with Kirill Gerstein), Piano Concerto No. 3, and Symphony No. 6 with a performance of Ronald Harwood's play Beloved Friend which looks at the relationship between Tchaikovsky and his patron, Nadezhda von Meck. James Gaffigan is conducting Kurt Weill's ballet The Seven Deadly Sins (with Storm Large as Anna), and the programme also has songs by Weill, Jurmann and Tiomkin, plus Korngold's early symphony. And those interested in going further can participate in a Come & Sing Kurt Weill event (alas for tenors and basses only). John Adams 2005 opera Doctor Atomic is being given a semi-staged performance with Gerald Finley reprising the role of Dr J Robert Oppenheimer. John Adams will be conducting, and Penny Woolcock directs. Francois-Xavier Roth, a conductor best known for work with period performance groups, will be conducting Berlioz's mammoth Grande messe des morts with the BBC Symphony Chorus, the Crouch End Festival Chorus and the London Philharmonic Choir. Not surprisingly the performance is at the Royal Albert Hall rather than the Barbican. Jiri Belohlavek conducts Dvorak's large-scale but relatively rarely performed Requiem, a work written for Birmingham in 1891. Arthur Bliss's The Beatitudes was written for the opening of Coventry Cathedral in 1961, but ended up being premiered in the Coventry Theatre because of Britten's War Requiem. The work's reputation has never quite recovered and a performance conducted by Andrew Davis gives us a chance to re-evaluate it. The first Total Immersion event of the season is devoted to the multi-talented Richard Rodney Bennett. This will include the film Murder on the Orient Express for which he wrote the music, plus a wide ranging selection of his concert music including Symphony No. 3, Spells and Anniversaries. The second Total Immersion is devoted to Philip Glass, who celebrates his 80th birthday and the event concludes with Marin Alsop conducting the UK premiere of Glass's Concerto for Two Pianos (with the Labeque sisters), plus Itaipu. The final Total Immersion of the season is devoted to the music of Edgar Varese, a chance to hear all his music performed in a single day. The BBC Singers, Singers at Six concerts include Rachmaninov's Vespers conducted by Elena Sharkova, Graham Ross conducting Britten, Judith Weir, Tavener, Howells and RR Bennett. Full details from the Barbican Centre's website.